Reading this book is a journey in itself. The book begins with the references to cancer in the past, in ancient texts. It then reaches to the struggle of Sidney Farber and Mary Lasker who initiated funds such as the "jimmy fund" and through extensive lobbying, advertising and sensitizing the public at large, bought the fight against cancer under the spot light. This book has a very strong backing of the extensive research that Siddhartha Mukherjee has done in writing this. One can feel the amount of effort that must have gone into writing every word as one reads this book. Also the writing style of the author is commendable.It is lyrical,elegant, insightful and intriguing. He has managed to stitch the facts, the stories and the history altogether in such a manner that is of the precise right mix. While reading this book one would not find oneself burdened with factual rambling or come across extra fine scientific theory; rather this book presents the scientific terminology in such a manner that one finds it interesting. Furthermore, the stories of patients such as Carla Reed, jimmy and many other keep the human touch alive and also helps one realize the full terror of cancer. I have also been interested in knowing about cancer. Wherever in school my biology teacher asked us to make a project on something I would always choose cancer. And when I learned about this book, I wanted to get my hands on it as soon as possible. And this book has exceeded my expectations exponentially. 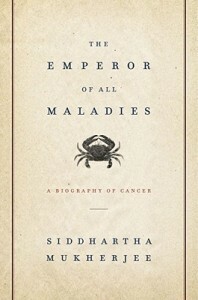 This book is masterpiece, a poignant journey through the history of cancer, the true biography of cancer.